A skilful balance of blocks and voids, painstaking care for details, for shapes, for materials and for colours. 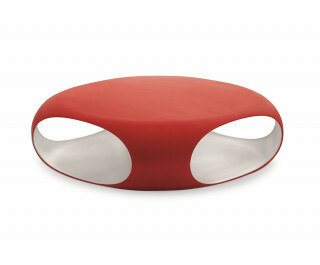 The Pebble coffee table is made of matt coloured polyethylene. The openings in the coffee table frame emphasise its roundness and provide a practical storage solution. Pebble is resistant to atmospheric agents and can also be used outdoors. It is available in a variety of exterior/interior colour combinations: white/white, white/anthracite grey, white/ powder blue, red/white, anthracite grey/white.